Funding and the state of the Animation Industry. Seeing as I've been lucky enough to get some incredible opportunities in the animation industry across this year, I'm setting myself a New Years Resolution.... in October. 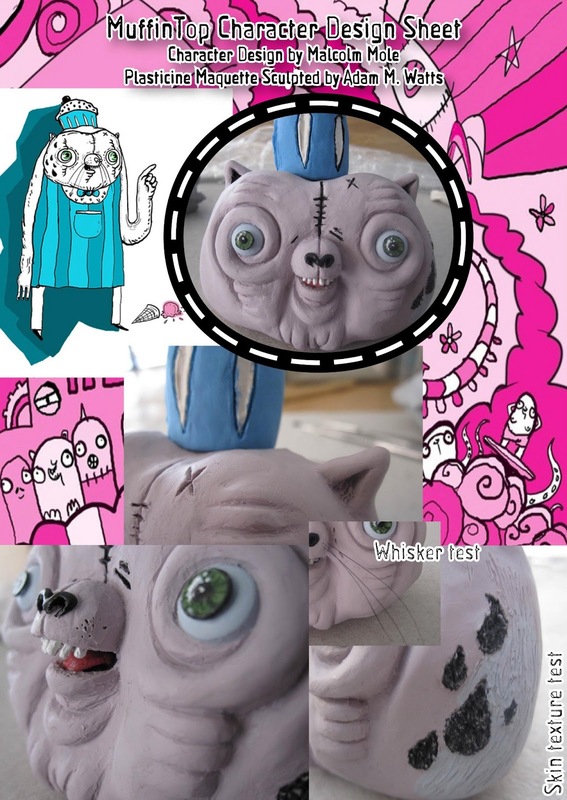 As long as I'm working (ie - earning) at the time, I'll support every independent Stopmotion, 2D and puppet/traditional animation project I can on things like Kickstarter/Indiegogo etc. If everyone in the industry did this, it would help keep the old-school styles alive (in these CG-dominated times) and help more of us stay in jobs. Or as I experienced when I backed Morph﻿ - a few months later I actually got a job on it. I helped fund my own job! I've already backed Aardman's Morph and Lee Hardcastle﻿'s amazing feature film pitch, which I'm still gutted didn't get funded. I've missed the boat on some amazing projects - but most of them got funded (like Toby "the baby from Labyrinth" Froud's Lessons Learned). I just thought the world should know, and please please please do your bit if you can! If you complain about the state of the industry but do nothing about it, you can't expect it to improve. Thanks for listening...... with your eyes. So this is weird. 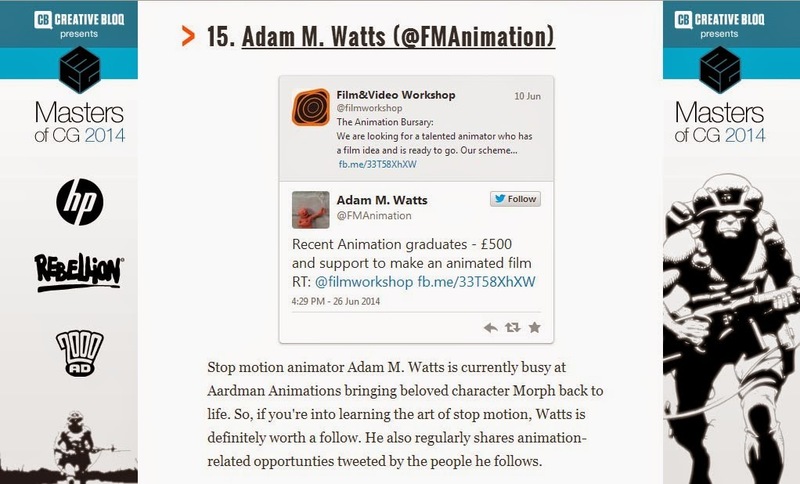 Turns out I'm one of Creative Bloq's 20 top animators to follow on Twitter... and I didn't even know until one of the other top 20 tweeted me a link to the article. There's a bunch of animators and directors from Disney/Pixar/Dreamworks and cult indie animators with 10-20 year careers..... and then little old me. It's insane, and I'm just waiting for a painful email from them, telling me that they made a huge mistake and have to take me off the list. As they pointed out, I try and regularly share stop-mo related jobs and opportunities, but it's at least given me an extra incentive to try and be better and more active, and keep focusing on pushing Stop motion in this CG dominated age. 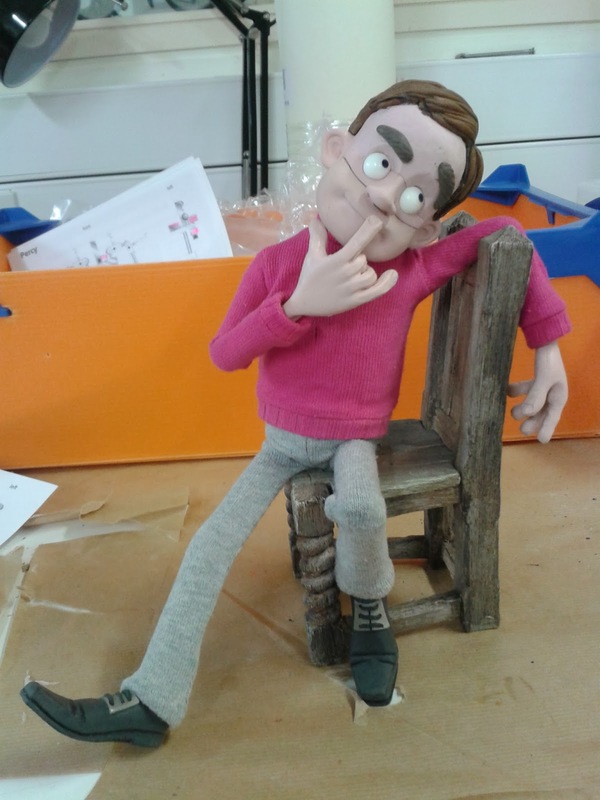 To quote my delightful sister ........ "calm down you're only number 15"
A few weeks ago I began a job as a Junior Animator on Aardman's new Kickstarter-funded 15 episode series of the iconic terracota trouble maker - Morph. I used to love watching Morph as a child - its one of the things that got me into Stopmotion animation (along with Nightmare Before Christmas, Wallace & Gromit and Trap Door). I backed it on Kickstarter when I first saw this, never thinking I'd be one of the (only) three animators working on it - and its such an amazing thing to be involved with. 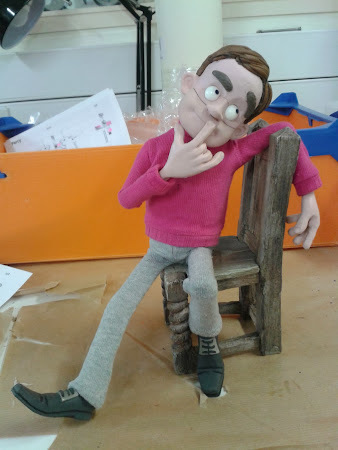 As my first paid job with Aardman it almost doesn't make sense to me. I'm working incredibly hard and animating like a crazy man. 8 seconds a day is the target - which is tricky with all the constant sculpting and modelmaking. Those little guys don't have armatures, so its pure plasticine, sweat and tears.... literally sometimes. Its all under closely-guarded wraps, so I can't put up pics, or give away plots - but just prepare to be (hopefully) dazzled. About time I updated this, to say I was over the moon to have offered a place on the brand new "Certificate in Character Animation" course - a 3 month intensive stop motion animation training course at the amazing Aardman Animation Studios based at their Gasferry Road studio in Bristol - a pilot course set up in conjunction with the prestigious National Film and Television School based in Beaconsfield, UK. This is the most incredible experience to be trained and receive workshops/masterclasses by some fantastically talented animators and industry professionals. Day to day, I'm being trained by Loyd Price - head of Animation at Aardman, with a long career most of us dream of (credits include Nightmare before Christmas, Chicken Run, Wallace and Gromit - The Curse of the WereRabbit, Flushed Away and Pirates.) It makes such a difference to be taught by someone who knows exactly what they're talking about, helping me to see where things are going wrong on a shot and understanding how to improve them. I'm learning loads, my animation skills have come on leaps and bounds - and I even got to pitch a feature film idea to the legendary Peter Lord (co-founder of Aardman - and a bloody marvellous chap). Amazing just doesn't quite cover it. Week 1 - Bouncing Balls. Going back to master the basics. Understanding arcs of motion, weight and bounce of different types of ball - tennis, pingpong and cannon ball. A whole week spent bouncing balls might not sound like a great time, but it became incredibly useful in later weeks and as my tutor Loyd frequently stated - in animation "...it all comes back to the bouncing ball". 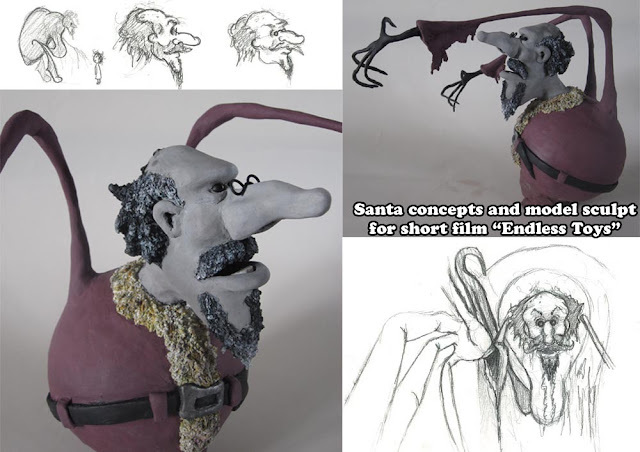 Our first week with a professional puppet from Aardman's feature film "Pirates". Learning to use the puppet, understanding its armature and its limitations of movement. Working on balancing weight, body stances, anticipation of movement and single direction thrust. Learning about arcs of motion and how different parts of the body will rotate before others, and at differing speeds. Learning to convey the illusion of weight, how it transfers and its impact on the body. One of the hardest things to convey in animation - a convincing walk cycle. As you rarely animate a character simply walking (they are almost always doing other things at the same time) it was useful to learn and understand the basics, which performance can then be laid on top of. I have shown here a straight walk, and one with a little more... swagger. Animating a walk with purpose. Practicing personality and character animation. One shows a relaxed character suddenly realising he is late and hurrying off in a panic. The second is tired and heavy (unfinished). Working with replacement mouths from the Aardman "Pirates" feature film, I had to break down a sample of speech from a Creature Comforts clip and work out and test the mouth shapes to ensure a clean read. After several reworks - I had the mouth shapes and timings worked out, and set about tying them to a strong character performance. Putting everything together from all the tasks learnt over the course I took a longer Creature Comforts clip, working out the mouths, planning a strong performance, and including a walk cycle, and several cuts. Stop Motion Showreel 2013 from Adam M. Watts on Vimeo. 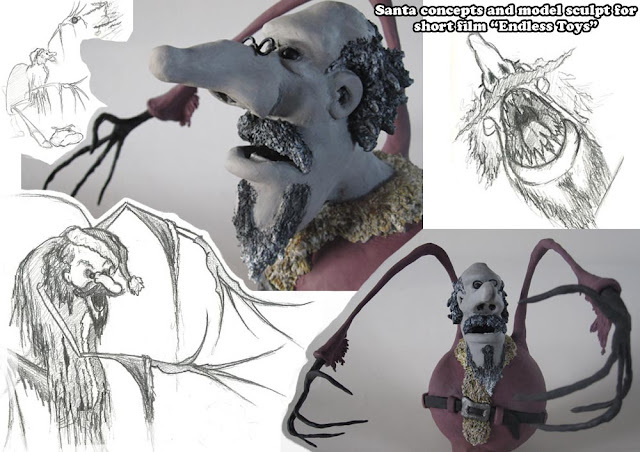 Thought I'd try a blog post of just some character sculpting/modelmaking work I've done for the world to peruse. 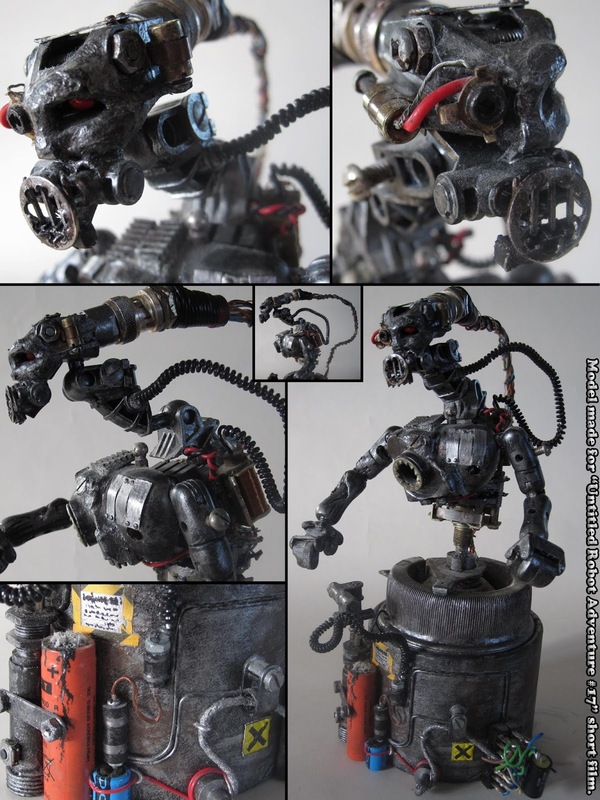 First up - my robot for my university piece "Untitled Robot Adventure #17" (2006). I didn't know much about lighting... or even animation for that matter... so the end result was a little disappointing looking at it now, but I learned a lot being my first ever stop-mo short film. And about 7 years on the model still looks pretty special (to me at least). Done a quick superglue fix up as it'd fallen apart a bit and finally took some quality photos. Next up, my graduation film "Endless Toys" (2007). Again, a large miss-fire on the lighting of the Santa scenes. It was meant to be dark and ominous, but it just ended up dark. Had to do quite an extensive clean up for these photos as he'd started to crumble in a box in the cupboard (urgent nose job required) and a bit of paint work needed. Made mostly with plasticine and milliput. And finally a maquette I knocked together while pitching for funding for an idea me and Mal had a few years ago. Just wanted to try actively sculpting to someone else's design for once and see how I could visualise a 2D drawn image in 3D. Still very much a work-in-progress... but fun to show off nethertheless. Went through several stages of looking like an evil pig - but I think I'm nearing the "slow-but-good-natured-bear" look. After 4 years of university studying Animation (dont ask) and then about 6 years of working in call centres and factories (again, seriously, dont ask!!!) in between amazing but short stints freelance animating/modelmaking, I've finally plucked up the courage to put together my greatest stop mo achievements in a "look at me, world... I can animate... honest!" kinda way. Enjoy, and please feel more than free to comment, like, share, facebook to your gran, whatever you kids get up to these days. Stop Motion Showreel 2013 from Adam M. Watts. Finally got my motion graphics... (should that be one word or two?!?!? I dont think I'll ever know!!!) ... showreel together. Let me know what you think. Im quite happy overall - just tried to keep it short and concise. MotionGraphics Showreel 2012 from Adam M. Watts. and also an up to date 2D/Flash animation reel. 2D/Flash Animation Showreel from Adam M. Watts. Been too rediculously long since my last post. Don't think anyone actually looks at this blog anyway... but it's nice to keep my mum updated, eh?!??! I did a quick animation back in November for the Red Bull Canimation competition. Didn't get anywhere with it, but had some amazing comments and over 1200 views now, and my anim was featured on StopMotionPro's website about the comp, which was pretty amazing!!! Anyhoo, enjoy with your eyes and brain. Sooooo...... an awesome advert I worked on over at Second Home Studios (after 3 months of punishing 6-7 day weeks - and 12 hour animating night-shifts) is finally live and looking absolutely ah-mazing. A paper cut-out stop motion epic, working using mainly different types, thicknesses and grades of paper (created using ancient processes I didnt even know existed), and various other trade secrets obtained from the delicious juicy brain of Chris Randall (director @ Second Home) we hobbled together one of the most impressive pieces of animation never to have graced the national TV screen. We're all so bloody proud of the final work and it was... almost ;p ...well worth our collective near-demise through physical and mental exhaustion and epic amounts of papercuts. Mostly we had a day-to-day core team of about 6 of the most talented and ruggedly beautiful people Ive ever met, and a good arrangement of other freelancers, work experiencers, and key specialists. LAST CHECK - 160,000 hits on youtube.com. WHOOT WHOOT!!! Finally some new work. I was involved in the model, prop, and set making for several CITV idents. I animated this badboy with my good friend Tristan Pritchard. Composited together by the bigman Chris himself. I sculpted the party horn, the three-part replacement klaxon horn, and the big jumbo CITV-logo Gong (out of super sculpy). Unfortunately I only made the robot, and helped out making the moon base on this one. Gotta love that rocket tho... props to Chris and Ian for that badboy!!! I made the mouse and mousetrap (both finished off by Ian - the gloryhogger!) and bits of set. 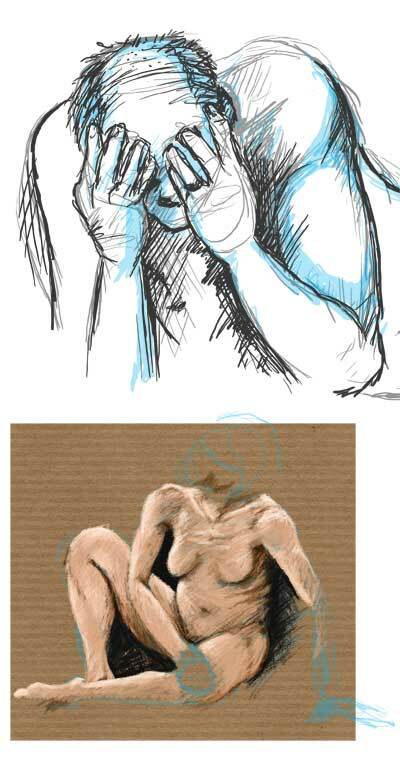 Looking for more work at the mo, but in the mean time here's a couple of quick life drawing sketches i did a while ago. Still brushing up on my After Effects and Flash skills, and just starting to run through some Encore tutorials. Hopefully they'll all come in handy soon. It seems everyone on the planet's done one of these already, but i wanted to try out my typography skills using a quick clip from Tarantino's "From Dusk Till Dawn". The new Flash version of the website I've been working on for months (at the minor cost of my own sanity) has just been put online by my awesome bro. I expect the flood of money and fame to start rolling in any day now!!! I've got a modelmaking gig lined up for a short film being made in london soon, can't wait to get started on that. Applying for a few other modelmaker/animator things too - fingers crossed I can get the ball rolling. Also if anyones based/lives in west-midlands and hasnt heard of this - check out Viral Kitchen. Its a pilot being run by the excellent guys over at Second Home I had the pleasure of working for a while back. Im definately applying and recommend everyone lend their support to it. Welcome to my new blog (I'll try and keep updated, honest).